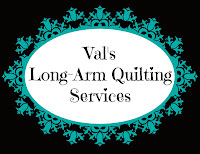 Val's Quilting Studio : A Queen Size Finish!!! My Raw Edged Flowers/Nine-Patch Quilt. A Queen Size Finish!!! My Raw Edged Flowers/Nine-Patch Quilt. YES!!! My Raw Edged Flowers/Nine-Patch beauty is finished!! It may have taken a year and two retreats...but here she is all quilted and off the frame. And as you can see I have just enough backing leftover to create the binding. YAH! All of the nine-patches were quilted using cross-hatch ruler work. I truly felt my quilting confidence grow as I worked on these. By the second row I had "found" myself a path and was able to complete an entire nine-patch in one run! I was pretty impressed with myself here. HAHAHA! When my husband got home from work and commented on how all the lines run together, all I could do was smile at him like a school kid and say: "I know!" You know what they say: Confidence comes from accomplishing something you didn't think you could do! Honestly, the borders were the hardest part for me to quilt as without the guide of the nine-patches, my ruler "skills" were definitely challenged as I wanted to continue the cross-hatch quilting into the borders. Hey, I only had a few "redos". Again, I'm so proud! My patient husband listened to me brag. FINALLY! YES! A Quilt for OUR Bed!!! Though it still needs it's binding and a trip to the washing machine, I couldn't wait to see how it fit on our the bed! And of course, Jackson followed me upstairs, as if he knew what I was going to do. I don't use pillow shams and love how the quilt covers our pillows as planned. It's also big enough that once I put our down comforter on come Fall/Winter, the quilt is still long enough on all sides. Which means, NO fighting over covers this year! Yes, Jackson there's even enough room for you! I'm so happy and okay, yes proud, to have this one done. I can't wait to get the binding done. Fantastic quilt, love how you quilted it, congratulations on a great finish!! Cannot wait to see what happens when you wash it. Cutie pie, Jackson, seems to approve too. WOW! You've done a beautiful job, making the quilt (the colors are fantastic) and quilting the quilt. I'm so jealous, I've always wanted to make a quilt for our bed. Maybe someday... Please pet Jackson for me, he's so cute!!! It looks fabulous Val great job! That cross-hatching is sweet, you should be pleased with yourself. Clearly, Jackson is. Lovely quilt Val! It is always a real sense of accomplishment when you figure out how to communally quilt a block or even a row. You should be very proud! Love it....set with the 9 patches is so great. It looks great on your bed and Jackson looks great on the quilt. I see Jackson has claimed that quilt for his own! Oh I am sure he might share it, but I bet he claims the middle, lol!!! Val it is a gorgeous quilt! I will love seeing how washing it changes the look. It will only look more cozy and loved. What a great quilt and your quilting is awesome. Nice job!! Great finish , Val. Love the scrappiness and whimsical flowers. Jackson approves also. Well, you SHOULD be proud. It's beautiful. I think it will be even more beautiful after you wash it. That is an awesome quilt. It fits so well with the bedroom decor. Aren't retreats just great to get sewing accomplished? Congrats on your big finish and trying something new. Your ruler work looks awesome. Jackson always gets the best quilts! This quilt turned out so lovely, and your quilting is spot on. Isn't it fun when husbands notice all the technical aspects of quilting? Mine does the same thing, hee hee. I love this quilt so much! It sure looks great on your bed--and I can see Jackson agrees--lol! Wow! That quilt really came out beautiful and the quilting is perfect. Congrats on an awesome finish, Val. You should be proud Val! It turned out fabulous! I spot some Henry Glass wovens in there, ask me how I know...lol. I started one of these but where you make the flowers and then cut them apart in four and sew them back randomly so it's a 4-patch of four different original flowers (if that makes sense) but it has sat for some time... LOVE seeing sweet Jackson perched for the photo op! You should put this in Pets on Quilts! Oh, Val, I love it!! This quilt turned out so beautifully! Yay for keeping it for your own bed where you can pet and admire it every single day :) Can't wait to see it post spa-day, too, all washed and crinkled.